K R Smith: Human 76 - It's Here! Human 76 - It's Here! The long-awaited post-apocalyptic anthology Human 76 is finally here! This isn't some skimpy little collection of short stories. 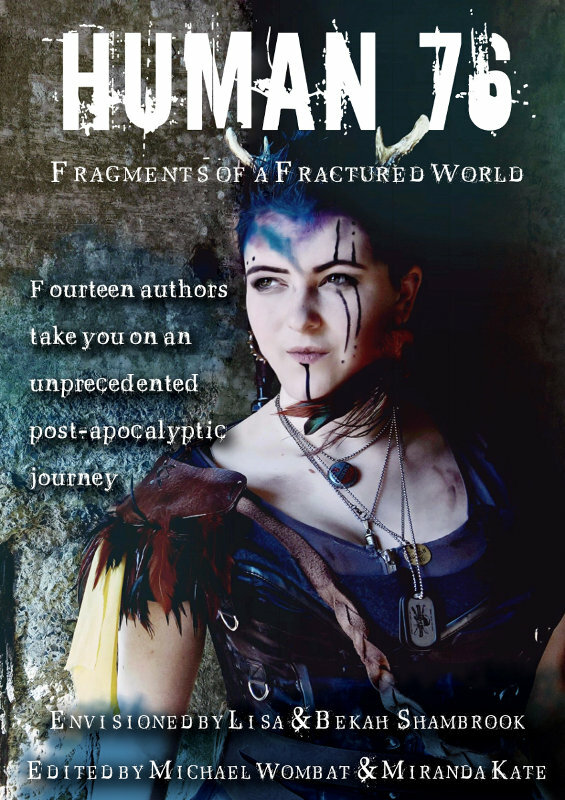 It's a beefy assortment of post-apocalyptic excitement from 14 points of view, all based around a young woman's search for her younger sister in an often-unfriendly world. The main character, Ghabrie (aka Human 76), is pictured on the cover, modeled by Bekah Shambrook. You can read more about how the idea for this anthology came to be on Lisa Shambrook's blog. As the girls faced each other, the silence overwhelmed them. Opposite to where they stood, the circle began to part. Just beyond the opening, a young woman waited, her dark hair swept back, the markings of a warrior on her face. Kendra whispered to Maeve, her voice quivering, "It's her! Don't look into her eyes, Maeve! If you do, she'll kill you!" Maeve launched herself at Ghabrie, but the deft swing of a muscled arm sent her sprawling in the dirt. Ghabrie grabbed her collar and lifted Maeve onto her knees. "Please! Please don't hurt him!" "They said you would kill me if I did." "I may kill you if you don't." I don't want to give away too much of this scene. It could spoil the story for others! You can get more info on the book on the Human 76 Facebook page. Lulu (ePub) - free for a two-week period! All proceeds from this book will go to Water is Life, a global charity that provides clean drinking water, sanitation and hygiene education programs to schools and villages in desperate need. Our book is about those displaced and struggling to survive in a dangerous world and this charity fits perfectly with our stories. So when you buy the book you will be helping those in need. © 2016 K. R. Smith All rights reserved. Cover image copyright Lisa Shambrook. It's here! It's here! Congratulations, K - this is very exciting! Your teaser excerpt is a tantalizing inducement to check out the anthology. Thanks! Somehow, I will make sure you get a copy! Human 76 - Goodreads Giveaway!